Is the $100 bill the next to go? The latest attack on the money in your pocket is the talk about eliminating the highest denomination banknotes. This discussion was intensified in the political policy world with the article by Lawrence Summers that appeared in The Washington Post. Summers is a professor at Harvard and had once been the Secretary of the Treasury and Director of the White House’s National Economic Council. Summers cites a paper by Peter Sands of Harvard and students that claims to make a compelling case to stop issuing high denomination notes and possibly withdraw them from circulation because of its use in crime and corruption. 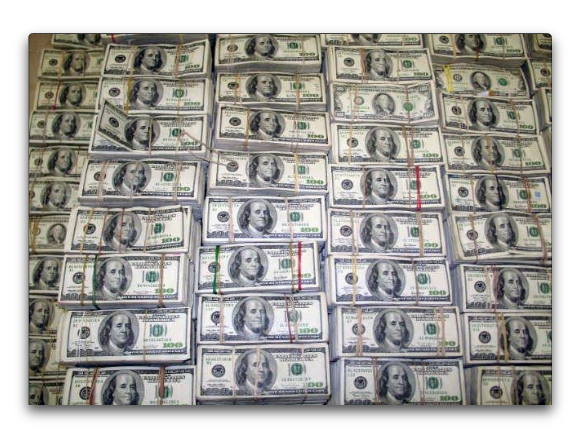 In order to carry out cash-based transactions is the ability to carry the cash. Sands’ paper and Summers’ article both say that lower denomination currency will make it difficult to carry large volumes of currency in order to make these transactions. Considering the weight of United States currency, carrying $1 million worth of $100 Federal Reserve Notes would weigh about 10 kilograms (22.0462 pounds). 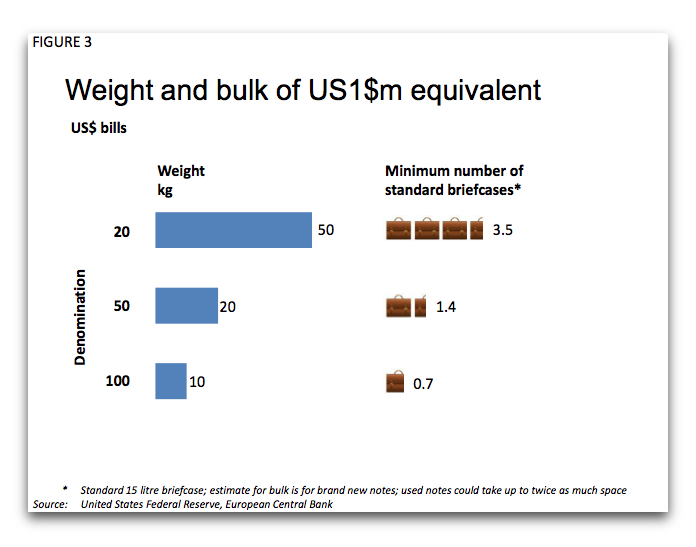 Using a 15 liters (just under 4 gallons) as the “standard” briefcase capacity, you could carry $1 million in 0.7 cases. As a comparison, $1 million worth of $50 Federal Reserve Notes would require 1.4 briefcases and 3.5 briefcases when using $20 notes. 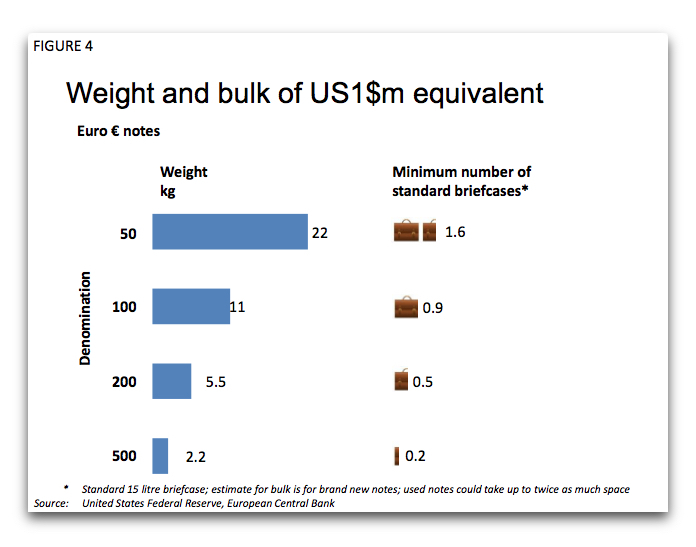 If the $1 million was being paid using €500 notes, it would weigh 2.2 kilograms or about 4.85 pounds that takes up a quarter of a briefcase. By eliminating high denomination, high value notes we would make life harder for those pursuing tax evasion, financial crime, terrorist finance and corruption. Without being able to use high denomination notes, those engaged in illicit activities – the “bad guys” of our title – would face higher costs and greater risks of detection. Eliminating high denomination notes would disrupt their “business models”. Summers agrees with Sands and even suggests that the baseline currencies, specifically the dollar and the euro, should “stop issuing notes worth more than say $50 or $100.” Both consider demonetizing these high denomination notes a step in the right direction. In the world of policy analysis there is the concept of the three-legged stool. The first leg is to identify the policy, which is what Sands’ paper does. Next would be to translate the policy idea into something that could be used as the basis for a law. The final step is something to drive the policy to be considered by the lawmakers in order to do something with the policy. This is how the one cent coin went from being 95-percent copper to being copper-covered zinc. There was the idea to change the composition of the coin in order to save money. After the idea, there was the research and the law writing that went into changing the composition. As part of that second-leg exercise was the creation of the 1974 aluminum cent pattern. Finally, by 1982, the costs were so out of line that it became the driver that forced action. Although the article and report has been well discussed as part of the financial press it is not likely to be acted on in the near future. It is only the first leg. It will take time before this stool gets its two other legs. Images were copied from the report “Making it Harder for the Bad Guys: The Case for Eliminating High Denomination Notes,” by Peter Sands, et. al.